Core structure of penicillins (top) and cephalosporins (bottom). β-lactam ring in red. β-lactam antibiotics (beta-lactam antibiotics) are a class of broad-spectrum antibiotics, consisting of all antibiotic agents that contain a β-lactam ring in their molecular structures. This includes penicillin derivatives (penams), cephalosporins (cephems), monobactams, and carbapenems. Most β-lactam antibiotics work by inhibiting cell wall biosynthesis in the bacterial organism and are the most widely used group of antibiotics. Until 2003, when measured by sales, more than half of all commercially available antibiotics in use were β-lactam compounds. Bacteria often develop resistance to β-lactam antibiotics by synthesizing a β-lactamase, an enzyme that attacks the β-lactam ring. To overcome this resistance, β-lactam antibiotics are often given with β-lactamase inhibitors such as clavulanic acid. β-lactam antibiotics are indicated for the prophylaxis and treatment of bacterial infections caused by susceptible organisms. At first, β-lactam antibiotics were mainly active only against Gram-positive bacteria, yet the recent development of broad-spectrum β-lactam antibiotics active against various Gram-negative organisms has increased their usefulness. Common adverse drug reactions for the β-lactam antibiotics include diarrhea, nausea, rash, urticaria, superinfection (including candidiasis). Infrequent adverse effects include fever, vomiting, erythema, dermatitis, angioedema, pseudomembranous colitis. Pain and inflammation at the injection site is also common for parenterally administered β-lactam antibiotics. Immunologically mediated adverse reactions to any β-lactam antibiotic may occur in up to 10% of patients receiving that agent (a small fraction of which are truly IgE-mediated allergic reactions, see amoxicillin rash). Anaphylaxis will occur in approximately 0.01% of patients. There is perhaps a 5%-10% cross-sensitivity between penicillin-derivatives, cephalosporins, and carbapenems; but this figure has been challenged by various investigators. Nevertheless, the risk of cross-reactivity is sufficient to warrant the contraindication of all β-lactam antibiotics in patients with a history of severe allergic reactions (urticaria, anaphylaxis, interstitial nephritis) to any β-lactam antibiotic. A Jarisch-Herxheimer reaction may occur after initial treatment of a spirochetal infection such as syphilis with a β-lactam antibiotic. Penicillin and most other β-lactam antibiotics act by inhibiting penicillin-binding proteins, which normally catalyze cross-linking of bacterial cell walls. In the absence of β-lactam antibiotics, the bacterial cell wall plays an important role in bacterial reproduction. Adding β-lactam antibiotics to the cell medium while bacteria are dividing will cause them to shed their cell walls and fail to divide, forming large, fragile spheroplasts. β-lactam antibiotics are bacteriocidal, and act by inhibiting the synthesis of the peptidoglycan layer of bacterial cell walls. The peptidoglycan layer is important for cell wall structural integrity, especially in Gram-positive organisms, being the outermost and primary component of the wall. The final transpeptidation step in the synthesis of the peptidoglycan is facilitated by DD-transpeptidases which are penicillin-binding proteins (PBPs). PBPs vary in their affinity for binding penicillin or other β-lactam antibiotics. The amount of PBPs varies among bacterial species. β-lactam antibiotics are analogues of d-alanyl-d-alanine—the terminal amino acid residues on the precursor NAM/NAG-peptide subunits of the nascent peptidoglycan layer. The structural similarity between β-lactam antibiotics and d-alanyl-d-alanine facilitates their binding to the active site of PBPs. The β-lactam nucleus of the molecule irreversibly binds to (acylates) the Ser403 residue of the PBP active site. This irreversible inhibition of the PBPs prevents the final crosslinking (transpeptidation) of the nascent peptidoglycan layer, disrupting cell wall synthesis. β-lactam antibiotics block not only the division of bacteria, including cyanobacteria, but also the division of cyanelles, the photosynthetic organelles of the glaucophytes, and the division of chloroplasts of bryophytes. In contrast, they have no effect on the plastids of the highly developed vascular plants. This is supporting the endosymbiotic theory and indicates an evolution of plastid division in land plants. Under normal circumstances, peptidoglycan precursors signal a reorganisation of the bacterial cell wall and, as a consequence, trigger the activation of autolytic cell wall hydrolases. Inhibition of cross-linkage by β-lactams causes a build-up of peptidoglycan precursors, which triggers the digestion of existing peptidoglycan by autolytic hydrolases without the production of new peptidoglycan. As a result, the bactericidal action of β-lactam antibiotics is further enhanced. Two structural features of β-lactam antibiotics have been correlated with their antibiotic potency. The first is known as "Woodward's parameter", h, and is the height (in angstroms) of the pyramid formed by the nitrogen atom of the β-lactam as the apex and the three adjacent carbon atoms as the base. The second is called "Cohen's parameter", c, and is the distance between the carbon atom of the carboxylate and the oxygen atom of the β-lactam carbonyl. This distance is thought to correspond to the distance between the carboxylate-binding site and the oxyanion hole of the PBP enzyme. The best antibiotics are those with higher h values (more reactive to hydrolysis) and lower c values (better binding to PBPs). If the bacterium produces the enzyme β-lactamase or the enzyme penicillinase, the enzyme will hydrolyse the β-lactam ring of the antibiotic, rendering the antibiotic ineffective. (An example of such an enzyme is NDM-1, discovered in 2009.) The genes encoding these enzymes may be inherently present on the bacterial chromosome or may be acquired via plasmid transfer (plasmid mediated resistance), and β-lactamase gene expression may be induced by exposure to β-lactams. The production of a β-lactamase by a bacterium does not necessarily rule out all treatment options with β-lactam antibiotics. In some instances, β-lactam antibiotics may be co-administered with a β-lactamase inhibitor. For example, Augmentin (FGP) is made of amoxicillin (a β-lactam antibiotic) and clavulanic acid (a β-lactamase inhibitor). The clavulanic acid is designed to overwhelm all β-lactamase enzymes, and effectively serve as an antagonist so that the amoxicillin is not affected by the β-lactamase enzymes. Other β-Lactamase inhibitors such as boronic acids are being studied in which they irreversibly bind to the active site of β-lactamases. This is a benefit over clavulonic acid and similar beta-lactam competitors, because they cannot be hydrolysed, and therefore rendered useless. Extensive research is currently being done to develop tailored boronic acids to target different isozymes of beta-lactamases. However, in all cases where infection with β-lactamase-producing bacteria is suspected, the choice of a suitable β-lactam antibiotic should be carefully considered prior to treatment. In particular, choosing appropriate β-lactam antibiotic therapy is of utmost importance against organisms which harbor some level of β-lactamase expression. In this case, failure to use the most appropriate β-lactam antibiotic therapy at the onset of treatment could result in selection for bacteria with higher levels of β-lactamase expression, thereby making further efforts with other β-lactam antibiotics more difficult. As a response to increased efficacy of β-lactams, some bacteria have changed the proteins to which β-lactam antibiotics bind. β-lactams cannot bind as effectively to these altered PBPs, and, as a result, the β-lactams are less effective at disrupting cell wall synthesis. Notable examples of this mode of resistance include methicillin-resistant Staphylococcus aureus (MRSA) and penicillin-resistant Streptococcus pneumoniae. Altered PBPs do not necessarily rule out all treatment options with β-lactam antibiotics. The β-lactam core structures. (A) A penam. (B) A carbapenam. (C) An oxapenam. (D) A penem. (E) A carbapenem. (F) A monobactam. (G) A cephem. (H) A carbacephem. (I) An oxacephem. β-Lactams are classified according to their core ring structures. β-Lactams containing thiazolidine rings are named penams. β-Lactams containing pyrrolidine rings are named carbapenams. 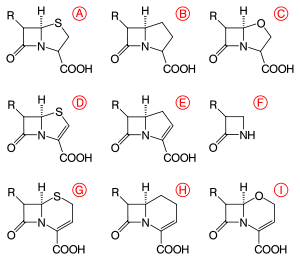 β-Lactams fused to oxazolidine rings are named oxapenams or clavams. β-Lactams containing 2,3-dihydrothiazole rings are named penems. β-Lactams containing 2,3-dihydro-1H-pyrrole rings are named carbapenems. β-Lactams containing 3,6-dihydro-2H-1,3-thiazine rings are named cephems. β-Lactams containing 1,2,3,4-tetrahydropyridine rings are named carbacephems. β-Lactams containing 3,6-dihydro-2H-1,3-oxazine rings are named oxacephems. β-Lactams not fused to any other ring are named monobactams. By convention, the bicyclic β-lactams are numbered starting with the position occupied by sulfur in the penams and cephems, regardless of which atom it is in a given class. That is, position 1 is always adjacent to the β-carbon of β-lactam ring. The numbering continues clockwise from position one until the β-carbon of β-lactam is reached, at which point numbering continues counterclockwise around the lactam ring to number the remaining to carbons. For example, the nitrogen atom of all bicyclic β-lactams fused to five-membered rings is labelled position 4, as it is in penams, while in cephems, the nitrogen is position 5. The numbering of monolactams follows that of the IUPAC; the nitrogen atom is position 1, the carbonyl carbon is 2, the α-carbon is 3, and the β-carbon 4. To date, two distinct methods of biosynthesizing the β-lactam core of this family of antibiotics have been discovered. The first pathway discovered was that of the penams and cephems. This path begins with a nonribosomal peptide synthetase (NRPS), ACV synthetase (ACVS), which generates the linear tripeptide δ-(L-α-aminoadipyl)-L-cysteine-D-valine (ACV). ACV is oxidatively cyclized (two cyclizations by a single enzyme) to bicyclic intermediate isopenicillin N by isopenicillin N synthase (IPNS) to form the penam core structure. Various transamidations lead to the different natural penicillins. This figure outlines the different methods of β-lactam closure among the various classes of β-lactam compounds. Penams and cephems are cyclized oxidatively (first row); clavams and carbapenems are closed by ATP-utilizing amidation (second and third row); and some monobactams may be closed by a third method (fourth row). The biosynthesis of cephems branch off at isopenicillin N by an oxidative ring expansion to the cephem core. As with the penams, the variety of cephalosporins and cephamycins come from different transamidations, as is the case for the penicillins. While the ring closure in penams and cephems is between positions 1 and 4 of the β-lactam and is oxidative, the clavams and carbapenems have their rings closed by two-electron processes between positions 1 and 2 of the ring. β-lactam synthetases are responsible for these cyclizations, and the carboxylate of the open-ring substrates is activated by ATP. 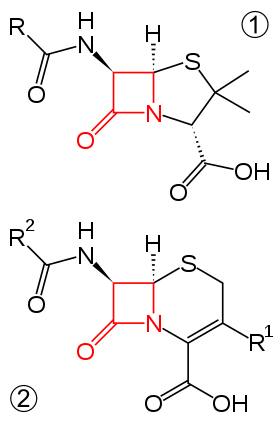 In clavams, the β-lactam is formed prior to the second ring; in carbapenems, the β-lactam ring is closed second in sequence. The biosynthesis of the β-lactam ring of tabtoxin mirrors that of the clavams and carbapenems. The closure of the lactam ring in the other monobactams, such as sulfazecin and the nocardicins, may involve a third mechanism involving inversion of configuration at the β-carbon. ↑ Holten KB, Onusko EM (August 2000). "Appropriate prescribing of oral beta-lactam antibiotics". American Family Physician. 62 (3): 611–20. PMID 10950216. ↑ Elander, R. P. (2003). "Industrial production of beta-lactam antibiotics". Applied microbiology and biotechnology. 61 (5–6): 385–392. doi:10.1007/s00253-003-1274-y. PMID 12679848. 1 2 3 Rossi S (Ed.) (2004). Australian Medicines Handbook 2004. Adelaide: Australian Medicines Handbook. ISBN 0-9578521-4-2. ↑ Pichichero ME (April 2005). "A review of evidence supporting the American Academy of Pediatrics recommendation for prescribing cephalosporin antibiotics for penicillin-allergic patients". Pediatrics. 115 (4): 1048–57. doi:10.1542/peds.2004-1276. PMID 15805383. ↑ Fisher, J. F.; Meroueh, S. O.; Mobashery, S. (2005). "Bacterial Resistance to β-Lactam Antibiotics: Compelling Opportunism, Compelling Opportunity†". Chemical Reviews. 105 (2): 395–424. doi:10.1021/cr030102i. PMID 15700950. ↑ Kasten, B.; Reski, R. (1997-01-01). "β-Lactam antibiotics inhibit chloroplast division in a moss (Physcomitrella patens) but not in tomato (Lycopersicon esculentum)". Journal of Plant Physiology. 150 (1): 137–140. doi:10.1016/S0176-1617(97)80193-9. 1 2 Nangia, Ashwini; Biradha, Kumar; Desiraju, Gautam R. (1996-01-01). "Correlation of biological activity in β-lactam antibiotics with Woodward and Cohen structural parameters—a Cambridge database study". J. Chem. Soc., Perkin Trans. 2 (5): 943–953. doi:10.1039/p29960000943. ISSN 1364-5471. ↑ Woodward, R. B. (1980-05-16). "Penems and Related Substances". Philosophical Transactions of the Royal Society of London B: Biological Sciences. 289 (1036): 239–250. doi:10.1098/rstb.1980.0042. ISSN 0962-8436. PMID 6109320. ↑ Cohen, N. Claude (1983-02-01). ".beta.-Lactam antibiotics: geometrical requirements for antibacterial activities". Journal of Medicinal Chemistry. 26 (2): 259–264. doi:10.1021/jm00356a027. ISSN 0022-2623. ↑ Drawz, S. M.; Bonomo, R. A. (2010). "Three Decades of β-Lactamase Inhibitors". Clinical Microbiology Reviews. 23 (1): 160–201. doi:10.1128/CMR.00037-09. PMC 2806661 . PMID 20065329. ↑ Leonard, David A.; Bonomo, Robert A.; Powers, Rachel A. (2013-11-19). "Class D β-Lactamases: A Reappraisal after Five Decades". Accounts of Chemical Research. 46 (11): 2407–2415. doi:10.1021/ar300327a. ISSN 0001-4842. PMC 4018812 . PMID 23902256. ↑ Macdougall C (2011). "Beyond Susceptible and Resistant Part I: Treatment of Infections Due to Gram-Negative Organisms with Inducible B-lactamases". Journal of Pediatric Pharmacology and Therapeutics. 16 (1): 23–30. PMC 3136230 . PMID 22477821. ↑ Dalhoff, A.; Janjic, N.; Echols, R. (2006). "Redefining penems". Biochemical Pharmacology. 71 (7): 1085–1095. doi:10.1016/j.bcp.2005.12.003. PMID 16413506. ↑ Lundberg, M.; Siegbahn, P. E. M.; Morokuma, K. (2008). "The Mechanism for Isopenicillin N Synthase from Density-Functional Modeling Highlights the Similarities with Other Enzymes in the 2-His-1-carboxylate Family†". Biochemistry. 47 (3): 1031–1042. doi:10.1021/bi701577q. PMID 18163649. ↑ Bachmann, B. O.; Li, R.; Townsend, C. A. (1998). 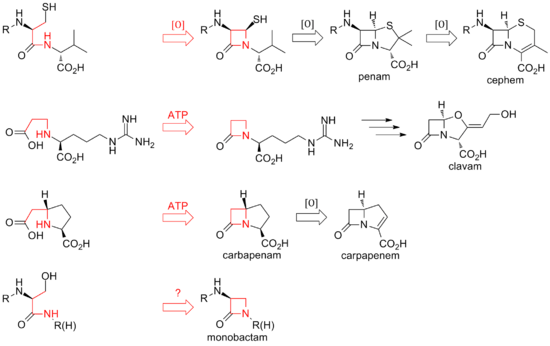 "Β-Lactam synthetase: A new biosynthetic enzyme". Proceedings of the National Academy of Sciences of the United States of America. 95 (16): 9082–9086. doi:10.1073/pnas.95.16.9082. PMC 21295 . PMID 9689037. ↑ Townsend, CA; Brown, AM; Nguyen, LT (1983). "Nocardicin A: Stereochemical and biomimetic studies of monocyclic β-lactam formation". Journal of the American Society. 105 (4): 919–927. doi:10.1021/ja00342a047.